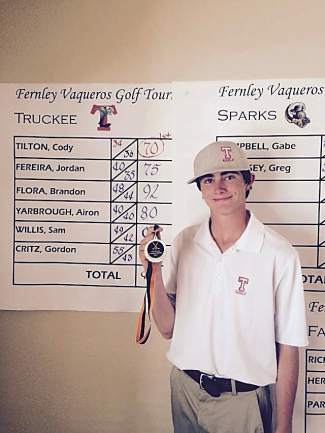 Truckee senior Cody Tilton was tournament medalist at Fernley last Thursday, carding a 70. The next Northern Division I-A tournament is scheduled for April 15 in Elko. Truckee senior golfer Cody Tilton recorded a first-place individual finish to help lead the Wolverines’ to third place in a league tournament at Fernley this past Thursday. Tilton fired a 70 to lead the field, which put him in a tie with Lowry’s Andres Mendoza for the league lead after three tournaments. He and Mendoza are both averaging 76.7 on the year. His Wolverines, meanwhile, posted a collective score of 408 for third place among the competitive field. Elko claimed the win with a 389 and Spring Creek was second at 402. Fallon (411) finished three strokes behind Truckee and was followed by Lowry (413), Fernley (495), South Tahoe (500) and Dayton (536). Truckee now ranks second in the Northern Division I-A standings with a 431 average. Elko leads with a 428.3 average and Spring Creek is third at 432.3. Aside from Tilton, senior Jordan Fereira carded a 75, Airon Yarbrough 80, Sam Willis 91 and Brandon Flora 92 to round out the Wolverines’ top five scores (the amount used for the team results). Also competing for Truckee were Gordon Critz (98) and Gabe Campbell (104). Spring Creek’s Daniel Mahlke and Elko’s Rance Black finished one stroke behind Tilton, each with 71s.